Coming straight off a PR in the 100m at the Mohave Electric Cooperative Invitational, Darin Alderman is the frontrunner for the 100 (10.74) and 200 meter (21.30). 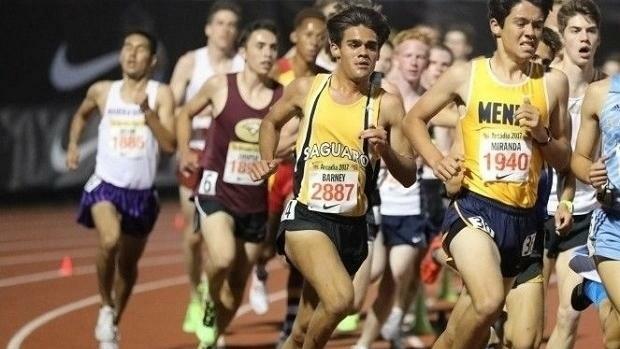 Saguaro High School senior Michael Barney is looking to sweep the competition in the 1600m and 3200m. Barney is listed with the fastest time in both events. Show Low High School's Jaisen Brown is currently leading the division in the shotput with a mark of 57-7. Not far behind Jaisen is Tim Fitzgerald from American Leadership Academy with a 56-10.5. Tim is not only a top competitor for the shotput, he also leads the division in the discus with a mark of 169-8. Jaisen Brown will be giving him a run for his money with a close mark of 167-1. Sean Barton (Sr.) out of Salpointe Catholic looks to improve upon his 3rd place finish from the previous year's state championship. Barton is currently leading the division in both the long jump and triple jump. Andrew Ference (Sr.) from Salpointe Catholic is the favorite for the pole vault, hitting his PR mark of 14-10 at the Harry Dutch Oliver Invitational. Buckeye Union High School boasts a division-leading PR of 42.80 in the Boys 4x100 Relay. Very close behind them is Salpointe Catholic with a time of 42.81. With such a small difference in time, anything can happen in this relay. Senior Allie Schadler from Rio Rico High School is leading multiple events in division III, including the 800m(time), 1600m(time), and the 3200m(time). Schadler will have some competition in the 800m and 1600m, but she holds a comfortable 30 second lead over the second place runner in the division. Jala Pickney, senior out of Walden Grove high school, has run two PR's in the past month, making her the favorite in both the 300m and 110m hurdle events. Pickney only leads Kelsey Schultz of Fountain Hills High School by .01 seconds in the 110m hurdles, so a close race can definitely be expected. Taylar Kregness, junior from Show Low High School, is the favorite for both the shotput and discus in the division hitting marks of 39-8(shotput) and 128-4(discus). Walden Grove's Nadia Dawson and Blue Ridge's Hannah Flodin will be battling it out in the 100m and 200m for the state title. Dawson leads the division in the 100m (12.13) and Flodin leads in the 200m (25.22). Both races are expected to be very close. The 4x400 teams from Fountain Hills High School and Empire High School are separated by only one second.